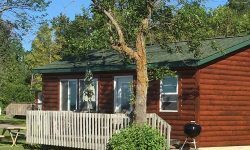 At Sullivans, we have 6 two bedroom housekeeping cabins, 1 three bedroom, and a large Retreat Home. All have a hide-a-bed or futon for extra sleeping room. 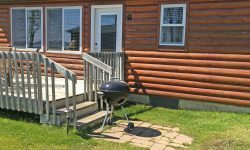 Each cabin has a deck with lawn chairs, flat-screen TV, a VCR or DVD player, air conditioning, shower, soft water, and a picnic table, charcoal grill, and fire pit. Bed linens, dishes, toaster, electric coffee maker, and cooking utensils are furnished. You will need to bring your own personal towels including bath and dish towels along with personal items including soaps. High chairs are available upon request. Please bring your own crib/pack-n-play. Sorry – no pets in cabins at any time. Park Model 8 – Park model cabin added in 2013. 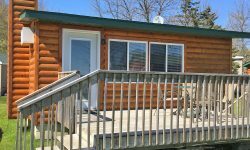 A beautiful cabin with a queen-size bed in the master bedroom and a loft with a double bed and futon. Full bathroom and central air. 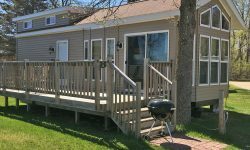 Park Models 9 & 11 – Park model cabins, air conditioned and beautifully decorated with a queen-size bed in the master bedroom and two twin beds in the loft for extra sleeping arrangements. 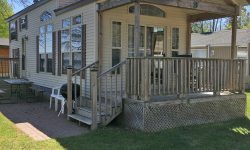 Full bathroom and a convenient porch for your outside enjoyment while staying out of the elements. 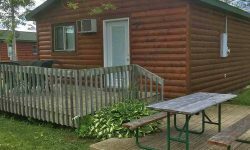 Cabins are generally reserved by the week, and a deposit is required. Check-in time is after 3:00 PM on Saturday and check-out time is prior to 9 AM the following Saturday. 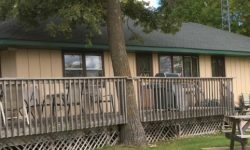 NEW FOR 2019 – Vacation rental next door to the resort, 2500 sq ft, 3 bedroom, 2 bath, large kitchen, family room, large deck, screened porch – Sleeps 8-10, access to resort amenities, pictures coming soon – Call for availability, pricing.